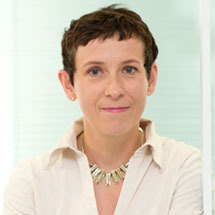 Anne Bertolotti, from the LMB’s Neurobiology Division, has been announced as the British Society for Cell Biology 2014 Hooke Medal winner. The Hooke Medal is awarded annually to an outstanding cell biologist working in the UK, who has been working as a principal research scientist for less than 10 years. Previous LMB winners include Ben Nichols and Matthew Freeman. Anne has been a group leader at the LMB since 2006. Her lab is interested in understanding the mechanisms underlying the deposition of proteins of abnormal conformation in cells, a hallmark of many pathological conditions, such as neurodegenerative diseases. In addition, she is looking at strategies that can help cells boosting their natural defenses against misfolded proteins, aiming to correct numerous conditions characterized by the accumulation of misfolded proteins. Anne focuses on fundamental cell biological processes and uncovers novel strategies to manipulate disease-relevant pathways. Her lab has contributed to our current understanding of the mechanisms governing aggregation of disease-related proteins and discovered potent strategies to rescue from protein misfolding stress. Anne will receive her medal and give the Hooke Medal lecture at the British Society for Cell Biology and British Society for Developmental Biology spring meeting at the University of Warwick, 16-19 March 2014.